Begin your decompression. Linger over breakfast on your balcony overlooking the water. Hop in a double kayak for a leisurely explore. Paddle to the Old Bird Cage Lighthouse. Slip over the side, and snorkel the wreck of the Christina Nilsson. Wander down to Door County Brewing for lunch from Chives food truck which is parked in the beer garden all summer. Let the kite boarders entertain you as you play backgammon on your balcony with a bottle of chilled chardonnay. Ten minutes to the Gordon Lodge for waterfront dining and an incredible sunset, summer evenings don’t get better. Indulge the child within at Pirate’s Cove Mini Golf and Johnson’s Go Kart Track in Sister Bay. Picturesque Ephraim is the place for lunch. Wilson’s is a classic soda fountain with mouth-watering hamburgers and the obligatory ice cream cone while you stroll the waterfront. Take advantage of the host of water activities, parasailing, jet skiing and boat rentals. Hop in the car, 10 minutes to the best sunset casual dining “al fresco” Fred & Fuzzy’s, then a Midsummer’s Music Festival concert, renowned for the stunning and varied settings in which they perform. A morning sailing charter is a great way to start the day! Bella leaves Ephraim at 10:30 for a two hour tour. Lunch is overlooking the shopping bustle in Fish Creek at the Cookery. Shops in Egg Harbor will fill an afternoon or drive a short distance to Murphy Park and take a dip in the cool waters of Green Bay. Dinner at Parador is lovely tapas with an emphasis on locally produced fresh, fresh food in Egg Harbor. Birch Creek is on the way back to Baileys Harbor, where the big sound of the professional musicians fills a charming, renovated barn! Set the alarm. Charter fishing boats leave the Baileys Harbor marina early to land the big ones! Trolling for lake trout and salmon is exhilarating. After the boat docks, cross the street for lunch at the Cornerstone Pub. An afternoon at Whitefish Dunes is next followed by a Door County Fish Boil at the Old Post Office in Ephraim, then take in a performance of Door Shakespeare performed under the stars at nearby Bjorklunden. Rock Island is the destination. Stop at one of the farm markets on the way to the ferry dock. Pick up a loaf of bread, cheese and smoked fish for a picnic. 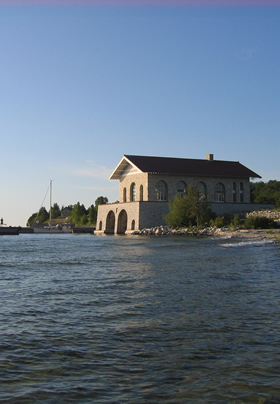 Catch the Washington Island Ferry from the Northport dock. The crossing of Death’s Door offers views of Poverty and Plum Island Lighthouses. Marvel at the scenic beauty of Washington Island as you traverse the island to Jackson Harbor to pick up Karfi, your ride to Rock Island. No cars, no bikes, no food, just curious buildings, enchanting hiking trails, pristine beach and breathtaking views. The Wickman House is a fine choice for dinner once back on the mainland followed by a performance of the Peninsula Music Festival. Your last full day on the peninsula and you have not been to Peninsula State Park! Nicolet Bay beach is chock full of activity; rent boats, kayaks, bikes or segways and explore. Lunch at the The White Gull Inn. Spend the afternoon strolling Fish Creek and poking in the shops. The Wild Tomato is at the entrance to Peninsula State Park and offers mouthwatering wood-fired pizza al fresco. Return to the park for a performance of Northern Sky Theatre. Under a canopy of trees and stars, the stage comes alive with original musical comedy that will leave you smiling. Oh, Oh – today is check out day. Enjoy one last kayak as the sun rises over the harbor in a blaze of orange leaving the water glistening with diamonds of light. Linger over breakfast. Jump in your whirlpool one last time. Alleviate the pain of your departure by taking a slice of Door County with you with one last stop at Sweetie Pies in Fish Creek on your way home.